What happens when you combine two best practices? Do you get best practices on steroids? Are two best practices always better than one? Is there a chance that they conflict with each other? Can they be used in a complementary manner to accelerate your business’ growth and performance? 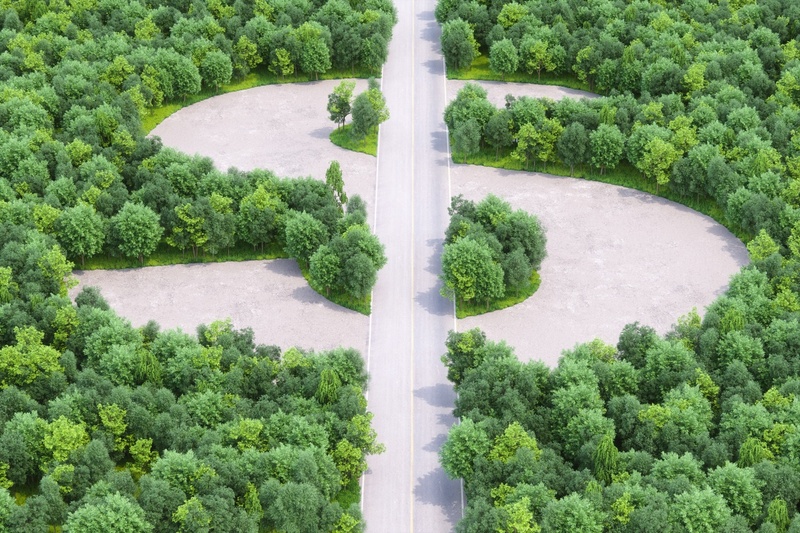 The integration of Horizon Growth planning with EOS/Traction may seem to be putting two unlikely and incompatible best practices in the same room. 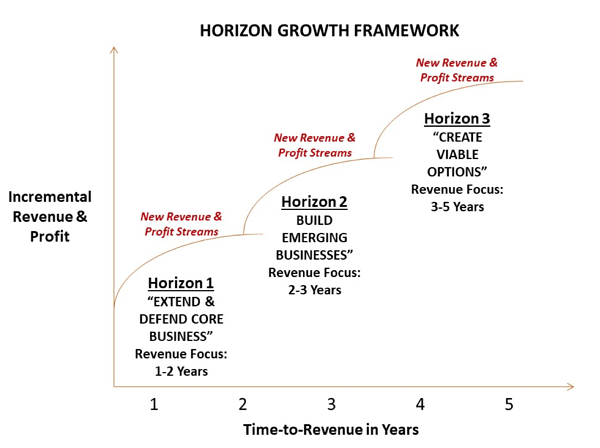 Horizon Growth planning was introduced in 1999 in a book titled The Alchemy of Growth: Practical Insights for Building the Enduring Enterprise by several McKinsey associates (Baghai, Coley, White). You can learn more by searching online or you can purchase the book. EOS/Traction is a more recent business phenomenon and is used by many small and mid-sized businesses to streamline their management practices and align their organizations to improve accountability and performance. Traction: Get a Grip on Your Business was introduced by Geno Wickman in 2011. Now, what small- or mid-sized executive team wouldn’t find each, or both, of these best practices relevant? Both promise results, both state they are practical approaches, and both are focused on continuous improvement—one through improved planning and the second through improved execution. Horizon Growth describes “WHAT opportunities are there to grow content,” and Traction could be described as “the HOW to implement processes” which are in search of content. And that’s where the integration opportunity comes into play. Let’s do a brief introduction on each best practice. 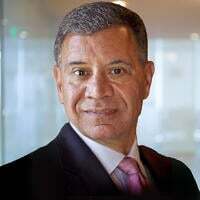 I would characterize the power of Horizon Growth planning as helping executive teams get out of short-term thinking and into new ways of understanding revenue and profit streams. One challenge for small- and mid-sized business (SMBs) is to spend more time thinking about future business growth while also paying attention to short-term business performance. I would argue that the highest performing businesses are those with BOTH a shorter term operational focus (including short-term revenue generation) AND the ability to develop and proactively manage a portfolio of longer-term growth opportunities. It’s easier to do one only, and the one that usually gets all the attention is the short-term focus. Business incentives tend to reward short-term thinking and operating. But the best time to work on longer-term revenue and profit opportunities is when you can, not when you have to. Waiting too long may mean facing a revenue challenge in a year, or two, or three which is insurmountable. The revenue step might be too high, the lack of capital to invest from weakening financial performance a constraint, and the risks much more challenging to mitigate as time works against you. Looks pretty straightforward, doesn’t it? But, the simplicity of the framework is both compelling and challenging. How, exactly, do you go about identifying new revenue and profit opportunities, understand and profile them, compare them consistently, understand financial investments and returns, and develop them into solid business cases or plans which you can present to your board or stakeholders to secure investments required to bring these opportunities from the idea or concept stage into real contributors? 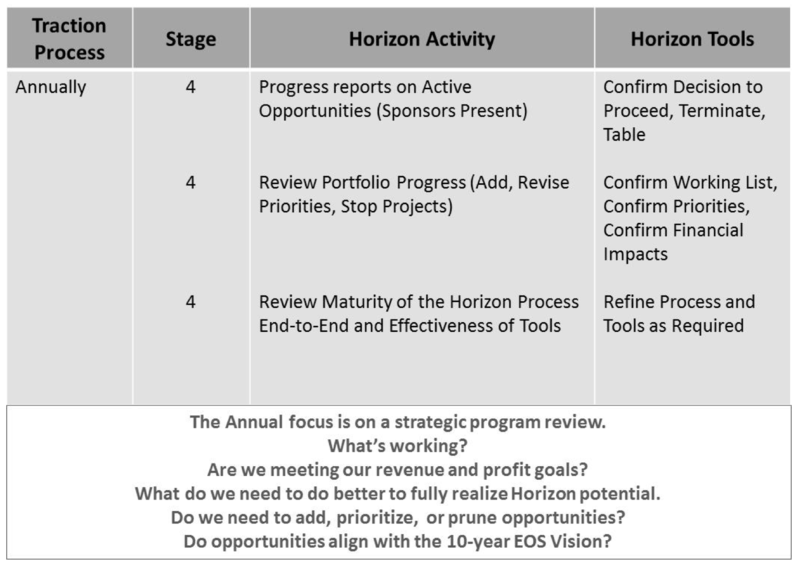 To operationalize Horizon Growth planning I have added a stage-gate process with associated playbooks and tools. Call these “companion pieces” to help bring Horizon Growth into your business in a practical manner. 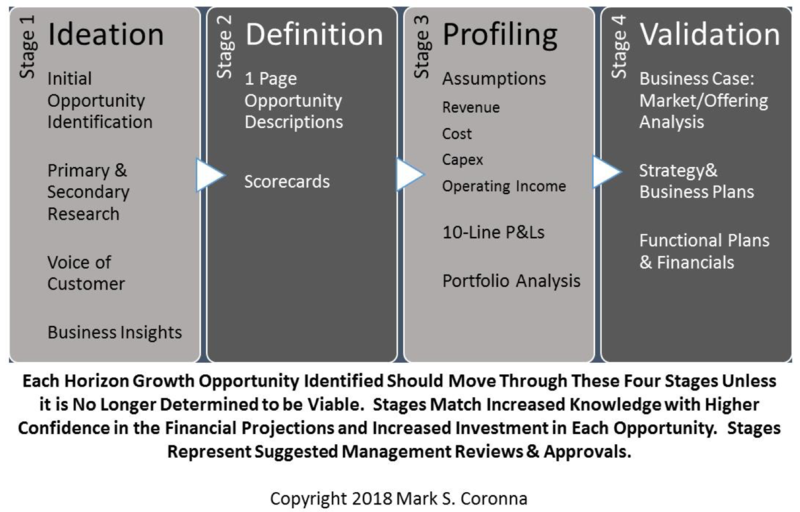 Each stage builds on new knowledge and learning, and the stage-gate approach matches investment and time with opportunities as they become better defined, scored, and modeled. 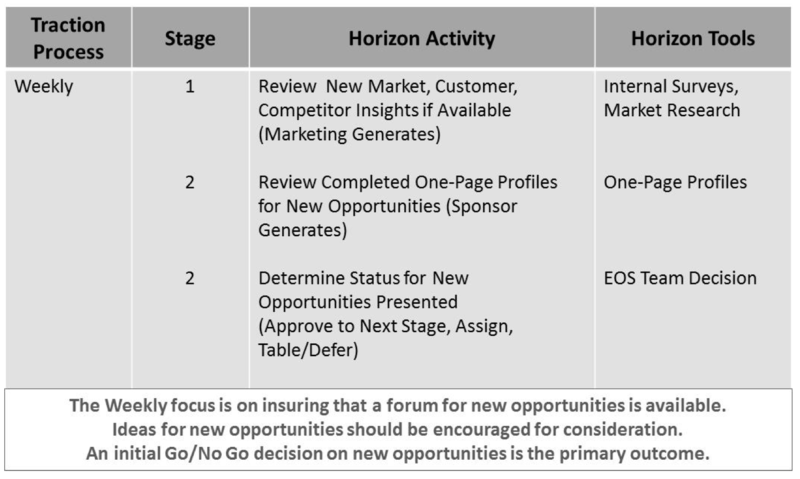 With this primer on Horizon Growth completed, let’s now turn our attention to the value of Traction. While Traction is focused primarily on entrepreneurs, I would bet that 25-30% of the SMB clients I have worked with in the past five years are using it in some form. A few are “Religious” users--the capital R referring to their complete buy-in--but more are less formal users who have adopted Traction in principle and have embraced many of the tools but have customized it to their existing management practices and processes. The value of Traction, according to the author, are “a clear vision shared by everyone, right people in the right seats, a close pulse on operations, and a format for issue resolution and communication.” The benefits of Traction are improved time and people management, improved alignment of staff, and improved accountabilities. Does this sound beneficial to you? The value of the model has broad appeal, which is why Traction has become a proxy for improved management practices and policies. How do you Integrate Horizon Growth and Traction? If you see value in both Horizon Growth and Traction as individual best practices, you might be asking how they can both be integrated into your business. Both are described by processes and both promise practical guidance. So, how exactly might you embrace both? The stage gate approach is a version of Traction for long-range vision planning. Traction itself does not do a very good job of capturing visionary input. The Horizon Growth opportunities identified and managed through this process are really a continuous improvement plan for the business’ vision. They can be broken down into a series of stage-gate activities and treated as “rocks” in the Traction model to ensure that regular progress is made in understanding and evaluating their potential for new revenue and profit streams. Integrating them into Traction helps you proactively manage these activities and improves your ability to make them real. Here’s a model for integrating the stage-gates from the Horizon Growth model into the Meeting Pulse described by Traction. The addition of relevant Horizon stage-gate activities into your established Traction Meeting Pulse will allow you to see the benefits of both best practices. You will still retain a focus on short-term operations while also creating a regular opportunity to discuss longer-term revenue and profit-generating opportunities. Research done by the University of Texas has shown that strong operational companies which add a growth component significantly outperform their peers. That’s a powerful combination to drive both growth and improved profitability. To achieve these results, you might have to add another standing item to your L10 meetings, but I’d rather add something important like an agenda item corresponding to your future growth than stick with a narrowly defined agenda. You will also have rich content to populate your Traction 10-Year Vision. It’s often easy to fall into “either/or” thinking. 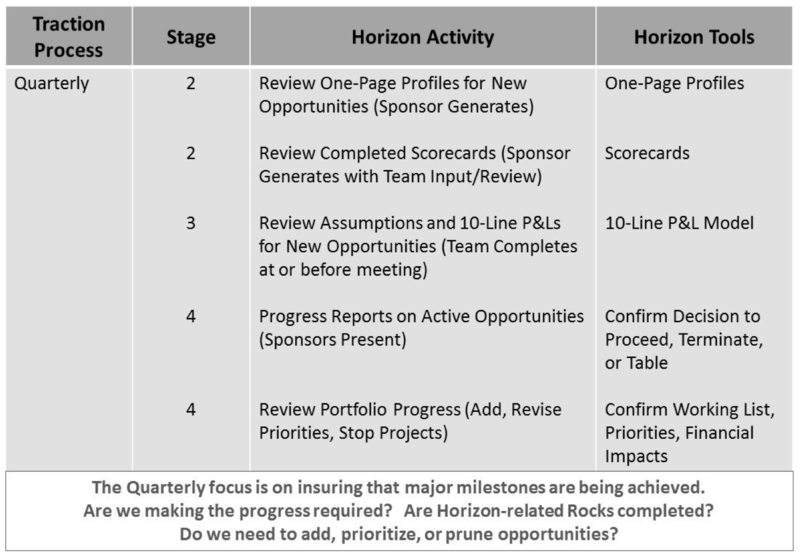 By integrating Horizon Planning with Traction, you move into “both/and” thinking. That helps you proactively manage both current performance and future growth. Better planning, combined with better management processes, is an excellent way of achieving better results.